I am a big fan of photography and read lots and lots on this topic. You can find my amateur attempts at photography here. With our 2 week old newborn son, I have been trying to take some good photographs of him to capture some of those rare moments we want to cherish later in life. But, photographing babies has to be the hardest thing ever. Of course, with the Internet and so many photographers blogging these days I started to look for some good tips. Here are some tips I gleaned from various sources. Newborn babies can be easily ‘posed’ when they are asleep. And they tend to go into a deep slumber right after he/she is fed. If not sure, ask the mom – she knows best. Before the baby falls asleep, make sure he is dressed in something you can easily remove. Newborns look fabulous with no clothes on. 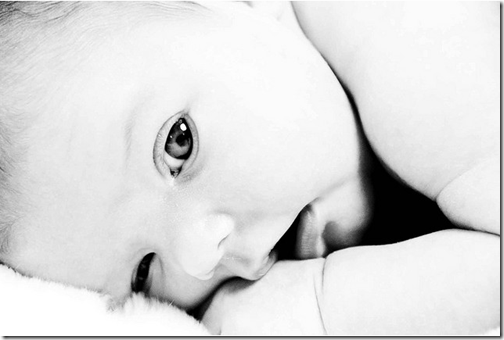 Plus it brings out that sense of vulnerability and unadulterated beauty only newborns have. Need I say more? Since you are going to be shooting the baby bare skinned, it will pay to keep the room at 73-74F. Use a space heater if you must. This will help reduce getting peed all over if the room is chilly. You may be a big fan of Anne Geddes, but try to keep your poses simple and props simple. 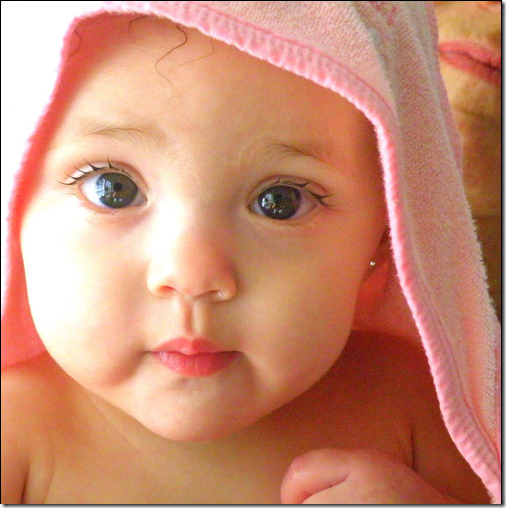 Plain white towels, soft blankets, usually give nice texture to the pictures. Like with any portrait photos, try to avoid flashes. This might mean shooting at wide apertures, cranking up the ISO, etc. Best way to accomplish this is to shoot besides a window or turning on lights in the room if shooting at night. If it’s a particularly bright day, use a white sheet by the window to diffuse the light. We often lose perspective of how tiny the baby is. You can use mom or dad to give scale. You can shoot with just mom’s hands or dad’s feet in the photograph. If the baby is not fast asleep, you can try using a white noise machine to try and mimic the surroundings when the baby was in mom’s womb to put him/her at ease. There are even iPhone and android apps for it. Babies can sense if the mom or dad being stressed out. If you want a calm baby, try putting mom or dad at ease while you are taking the pictures. Befriend a Photo EditorThere are tons of photo editing software – free and paid ones available. You are going to need it to make some adjustments for those perfect pictures. Newborns are going to have red spots, peeling skin, snot, dried milk and all sorts of tiny blemishes that might look exaggerated when looked in a big picture. Use a photo editing software to clear out those retaining that beautiful moment you managed to catch. Bonus tip: Keep a camera in the nursery. You’d never know when an opportunity would present. It helps to keep your camera gear nearby. If that’s not possible, keep in mind the best camera is the camera you have on you. No wonder I am taking most of my son’s pictures with my iPhone. As a new dad myself, I know most of these tips are easier said than done. But, I am ready to take 100s of shots to get that one great picture that I can boast of. Hope these tips are helpful to you as they were to me. If you share your photos online, leave links to your successful baby shots in the comments. You can check out our photography blog for posts on camera gear, deals, tips, etc. Thanks for the great overview. I tried to post a comment previously, but it hasn’t shown up. I think your spam filter may be broken? My brother-in-law just had a baby and they had an excellent photographer right at the hospital. It really got me interested in baby photography. I’m a bit of an amateur, myself – done a few weddings, but mostly for friends. I’m really trying to start photography little ones. These tips are great! Especially your comments about using soft textures and avoiding using a flash. Thank you. Thank you for your tips on how to photograph babies. I find that if you get in close and crop out any distracting items in the room and there is lots of light you can’t go wrong! I really appreciate your advice and will be using it on our newborn.